Last night I baked soda bread to bring to my office today, and mistakenly grabbed corn starch instead of baking powder. I didn’t realize until the dough was done and I had used up all my supplies of raisins and buttermilk. I assumed that was the end of soda bread for this year. On a whim, I put the pans in the oven anyway, and lo and behold, the resulting loaves were beautiful to look at, at the very least. So I brought them to work anyway, cut one open this morning, and it actually tasted delicious–my mistake hadn’t ruined everything after all. 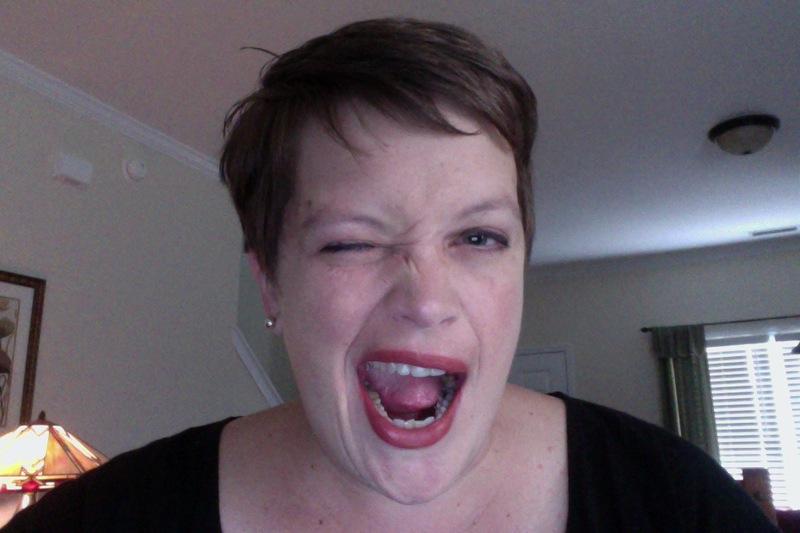 So Happy St. Patrick’s Day, and enjoy this tribute to Muse blogs past! 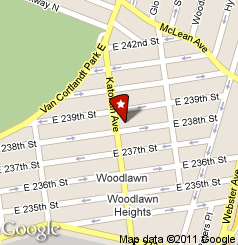 The Bronx neighborhood where I grew up was mostly Italian with a smattering of older German couples. But across the bridge in Yonkers, where McLean and Katonah Avenues crossed, it was a magical place—thick with lilting Irish brogues, Celtic-themed bars and German/Irish bakeries. In our neighborhood the Catholic church was St. Anthony’s. In theirs, it was St. Barnabas. On our side of the bridge we had Italian delis, Italian bakeries, and Italian “social” clubs. But on their side of the bridge, they had Irish football, step-dancing classes and Irish soda bread. I don’t want to give you the impression we lived with an “us” and “them” mentality. Oh no–on the contrary, “crossing the bridge” to shop, eat and visit friends was an everyday occurrence, and one of our regular stops was the bakery on Katonah Avenue. I don’t remember the name of it, because you never had to. It was “the bakery” on Katonah Avenue, and it’s where we all went to get non-Italian “buns”—or what you might call donuts and pastries. We’d go most mornings before my mom dropped me off at school—I’d get a muffin or a custard donut and mom would pick up a box of buns to take to my grandmother’s house for morning coffee. But the most wonderful time of the year at the Katonah bakery was Irish soda bread time. Let’s face it—soda bread might as well be purebred Irish. 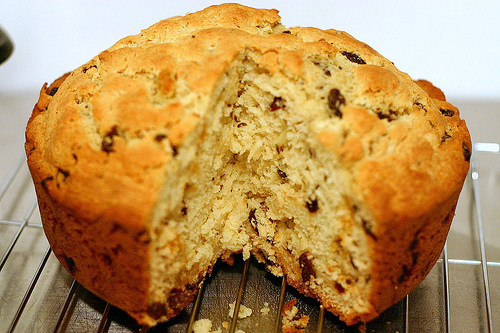 We find it in stores around Saint Patrick’s Day and it’s usually labeled IRISH soda bread. Serbians, we apologize. In my house we didn’t buy our soda bread in stores for long. My mom learned a friend’s recipe early on and she would always make a bunch of round loaves every year. The recipe itself evolved as new friends gave new input. Some used buttermilk, others sour cream; some included caraway sees, most did not. Some used regular old raisins and a few used sunny golden ones. Some washed the tops with egg whites and sprinkled with crystallized sugar. Some covered the whole top in powdered sugar. Just about all slathered on a thick spread of creamy Irish butter before biting into the scone-like cake when it was still warm from the oven. I now have in my possession FIVE Irish Soda Bread recipes—one from Betty “in Woodlawn,” one from Mary Cahalan (she of the toddler-on-toilet-drying tradition for readers of another of my posts), one from Bernadette who my mom worked with once we moved to Carmel, New York, one from Teresa Murphy (who lived off McLean and Katonah and whose little boys Brendan and Donal my mother looked after while she worked), and one from Ceil Campbell, another former co-worker of my mom’s. Some years I make several of the recipes and force co-workers into a taste-test situation. Other years I just pick one and go with it. It’s a hard choice because all five recipes are from sweet, wonderful women who I’ve known throughout my life and who I always identify with at this time of year when the soda breads are rising in the oven. Like so many foods, and so many recipes that come from someone’s own kitchen, the taste, the aroma, and even the act of mixing the ingredients, is a bit of a tribute to the people who made it before you. 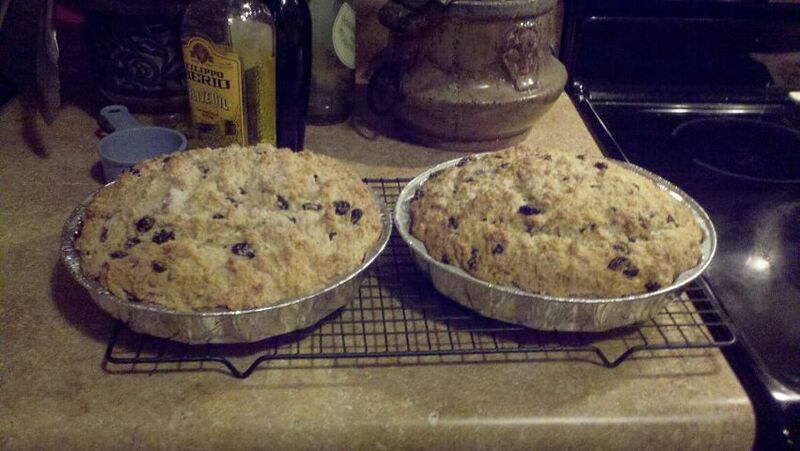 My soda bread will always be Irish, because it came from Betty and Ceil and Mary and Bernadette and Teresa. I’ll share my recipe for soda bread with you, but I won’t tell you which of the five recipes I’ve given you. 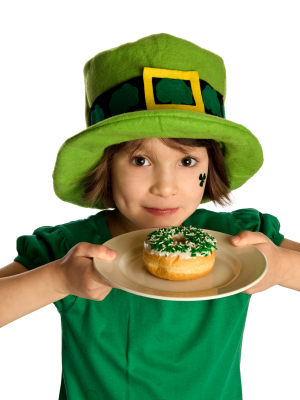 Take my word for it—they are all equally delicious and worth pulling out all year long, not just for St. Patrick’s Day. Sift together the dry ingredients. Gently stir in the butter, raisins and buttermilk. Knead gently and place in a lightly greased and floured round 8-inch pan. Bake at 350 degrees F for 55 minutes. 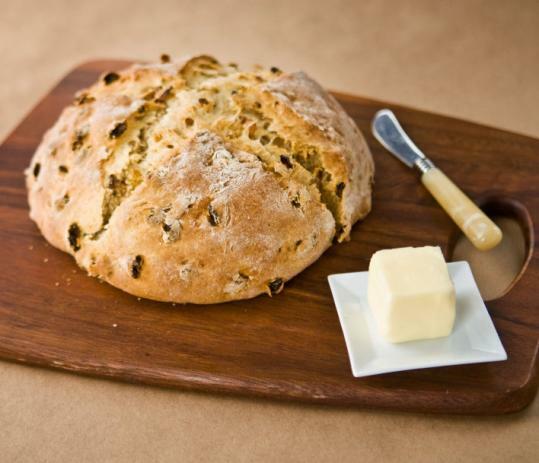 This entry was posted in Baking, Cooking, Creativity, Delicious, Experimenting, Irish Soda Bread, St. Patrick's Day, Yummy and tagged baking, cooking mistakes, Irish Soda Bread, mistakes, St. Patrick's Day. Bookmark the permalink.